Whenever an employee leaves, the business incurs both direct and indirect costs. Direct costs are put out to cover the separation, replacement, and training for new hires. Indirect costs, on the other hand, are reflected in the lost productivity. On average, Work Institute estimated that the cost of turnover is 33% of a worker’s annual salary. With a national average salary of $45,000, employers lose around $15,000 for each employee leaving. Of course, this number can be much larger in metropolitan areas where average salaries are higher. 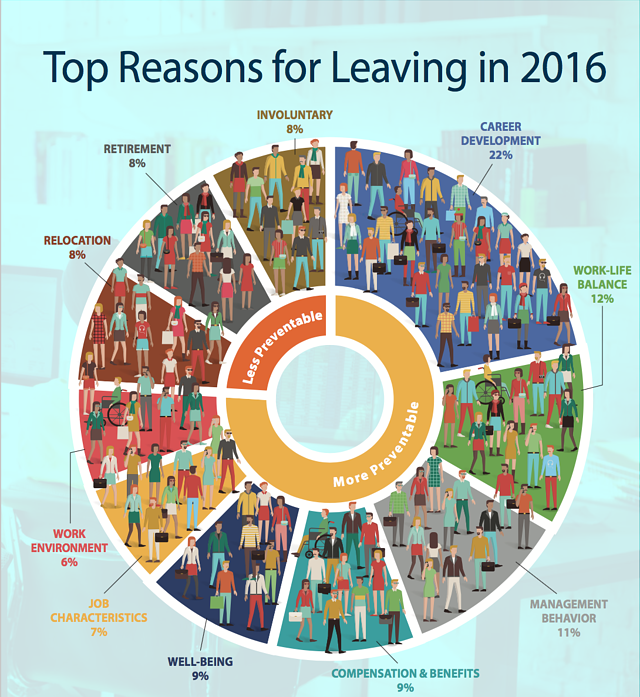 Within these categories, there are 65 reasons why employees left their former companies. While Career Development is the biggest reason, other environmental and cultural reasons also play a major role. Note here that most of these factors are actually controllable and preventable if the company pays attention to their employees’ needs and opinions. This fact is extremely alarming, because generally “it takes employees up to 3 - 6 months on the job before they add enough value to offset the cost of their hiring, onboarding, and compensation and benefits.” For this reason, if employees leave within their first year of employment, companies might realize little positive return (or even none at all) on these hires. Well-being and Work-life balance, on the other hand, is a continual process that companies need to work on all the time; they are the results of your workplace culture. If you focus on taking care of your employees and their dependents, their well-being and work-life balance are likely to improve. If, however, managers and companies consider their workers as machines to be exploited, then it is not a surprise that well-qualified employees choose to devote their time and effort somewhere else. As mentioned above, it costs an average of $15,000 each time an employee leaves their company. That means that a $100,000 investment will pay for itself if it prevents seven employees from leaving if they otherwise haven’t. Of course, this number varies by companies, because a $100,000 might sound like a small fortune for some businesses and a drop in a bucket for others. Regardless, investing in your employee experience will set your organization apart from the thousands of others who are thirsty for the same talent that you have on your team. DIY: How Do I Organize A Step Challenge? If you found this article helpful, feel free to share it with your friends and colleagues! As always, let us know if you like our content and what you’d like to see next on our blog, we’re always here to help!